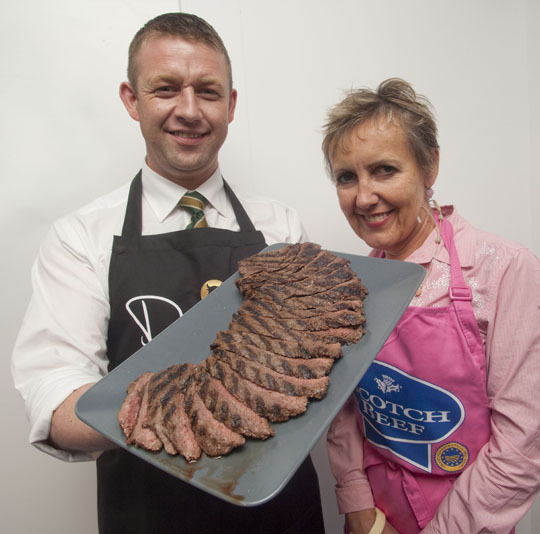 In an innovative move Aberdeen butcher, John Davidson, has developed the “Jurassic” Scotch Beef steak and during the past three weeks he has sold 2.5 tonnes to customers intrigued by the concept. The idea behind the development of the huge steak was, said Davidson, to offer customers a lower cost but highly flavoursome steak. The huge steaks have been creating quite a buzz in the shop and, as of last weekend, are also available via mail order throughout the UK at www.johndavidsons.com. The Davidsons’ staff have, however, had to correct a couple of their younger customers who mistakenly thought the steaks were from dinosaurs! “The steaks, designed to be shared by 15-20 people, create quite a talking point round the table or, weather providing, the BBQ,” Mr Davidson added. TV celebrity Aggie MacKenzie pictured with butcher John Davidson and one of his Jurassic Scotch Beef steaks sliced and ready to share. Undaunted by the wet weather Aggie performed all her demonstrations of dishes using Scotch Beef, Scotch Lamb and Specially Selected Pork in a stylish pair of pink wellies!